It is no secret to anyone that I am quite a fan of Discworld, and Sir Terry Pratchett’s off-the-wall fantasy world. I’ve spent enough time on this site alone talking about that. 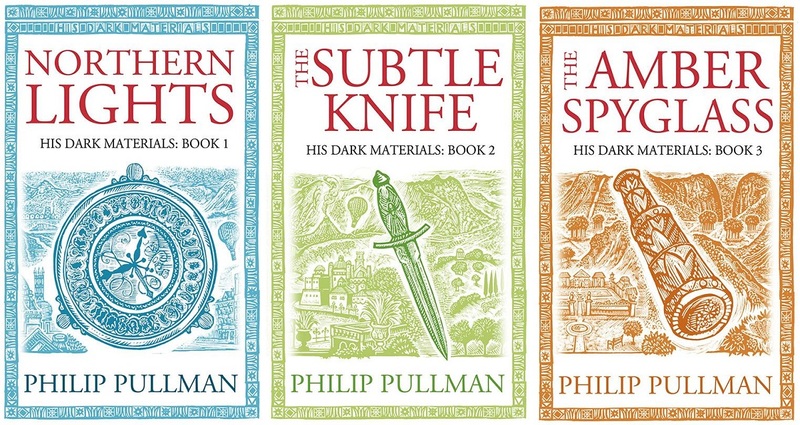 I thought it was only fair then to spend a little bit of time talking about the other great fantasy love of my life, Philip Pullman’s His Dark Materials. I’ve recently finished re-reading all three of the books, one after the other because once you start with Pullman you can’t stop, and I just have a lot of feelings that I need to share. If you’ve never dipped into this universe, then I don’t know what to tell you other than to start right now, and here are six reasons to do it. The main characters of this series, Lyra and Will, are only 12 years old. They go through a lot, and re-reading it as an adult, there were times that I actually found it quite hard to know that these were kids suffering as much as they do. But kids they are, because this is a YA series from before YA was even really a thing. It isn’t YA as we imagine it to be – not precisely, anyway – but I don’t think we should forget this is a series for young people. With that in mind, it is amazing how respectful Pullman is of that audience. He doesn’t dumb things down, he doesn’t try and sugar coat anything and he expects his readers to be able to follow along. The proof of this, I’m sure, is that I accidentally picked up The Subtle Knife (book two) when I was eight, and I just about managed to keep track of what was going on. When you consider the subject matter, that is no mean feat. If you like YA, you should read this, and if you don’t you should read it anyway, because it will change your perception of what YA can be. Speaking of Lyra and Will, they deserves their own bullet point. Heck, they deserve pages and pages to be written about them. They are only kids, but they are so special. His Dark Materials, when you boil it down, is a chosen one narrative, but where that trope can get old fast, this one never does. It doesn’t even really feel like a chosen one narrative, at least up until the end of the second book. Lyra and Will are the perfect opposites of each other; where Lyra has had a carefree childhood, perfecting her ability to lie and to charm her way around almost any person she meets, Will has been forced to grow up too quickly, learning to cope in the adult world, and once they come together, they are formidable. It is hard to describe their relationship without spoiling too much, but just know that every single adult in the story respects these kids and what they have the potential to be. I’m hard pushed to think of better child characters in any narrative, let alone in YA fantasy. Northern Lights (book one) starts in an alternative world, Lyra’s world, where every person has a daemon. Daemons are hard to describe, but they are basically a physical manifestation of what might be a person’s soul, which takes the form of an animal, and never leaves the person’s side. Lyra’s daemon, Pan, can change his form at will, like the daemons of all children can, but adult daemons are settled on one form. When I first read these books, daemons were the thing that I loved the most about them, and I still love them now. I think that they are Pullman’s greatest invention, and an element of these books that really makes them stand out from other fantasy. You have to read the books to really get how daemons work, but I defy you not to fall in love with the concept like I did. They are a great storytelling device as well as an important part of the plot. I also think though that they offer some comfort to a young reader, just like they offer comfort to the characters, and perhaps that is why I latched onto them when I was eight years old. A talking animal, which will protect their human no matter what and never leave them, is something very reassuring, especially as the books get progressively darker towards the end. His Dark Materials, like most fantasy series’, has a very large cast of characters. It kind of comes with the world building character of the genre, and it isn’t always the most well executed of concepts. Pullman is really good at character, so it rarely is a problem here, and you’re missing out on some very good creations if you haven’t yet read this series. I can’t possibly list them all and why I like them, but here are some highlights. Lord Asriel and Mrs Coulter, sometime allies and sometime antagonists, are my favourites, and their development over the series is almost as important as Lyra and Will’s. Lee Scorseby, the Texan aeronaut – originally a gun for hire – ends the series a hero. Iorek Byrnison, the armoured bear, is another classic. His Dark Materials might be a chosen one narrative, but Lyra and Will are never alone in it. It reminds me of the Lord of The Rings in how the supporting characters are so integral to the end of the story. I much prefer this kind of story to the ones where the supporting characters are almost incidental. I have kind of alluded to this already, but Philip Pullman is just a really great author. Like, really great. It is nerdy to admit to enjoying how well a sentence is written, and how well a story is constructed, but I am an aspiring author and I notice things like this. Pullman has a very light touch in his storytelling. He never tells you more than you need to know at any one moment, but you are also never once left wishing that he could have given you more. I think that his real strength is in characterisation. Some of the prose does get a little bit harder to follow in the last half of The Amber Spyglass (book three), but the characterisation never falters. I have read other stuff by Pullman and although I’ve never found a story of his that is anything like this masterpiece, I am always struck by how well written it all is. If you appreciate the finer side of writing, you should definitely treat yourself to some Philip Pullman. We don’t talk about the first attempt to put this on the screen, with the film The Golden Compass. It happened and we have to deal with it, but we don’t have to talk about it (even if I do think that Daniel Craig and Nicole Kidman were absolutely perfect casting for Lord Asriel and Mrs Coulter). Anyway, hopefully the ghost of that film will be exorcised soon, because the BBC is producing a TV show of His Dark Materials. It seems there will be a season per book, which is very respectful of the depth of the material, and I am beyond excited. Dafne Keen, the kid from Logan is playing Lyra, which is inspired. Lin-Manuel Miranda is playing Lee Scoresby, which feels like a casting that was done just for me. I am less enthusiastic about James McAvoy Lord Asriel, but I am willing to give it a go. I think we can be certain that this show will be a big budget extravaganza, and I am glad that the BBC are the ones producing it. I don’t trust any channel more to not mess it up too much. Knowing that this show is coming, you should absolutely settle down and read these books before that. I think the show will be something special, and knowing the story will make it even better in the long run.